Ok, people. I’m in Dubai, the shining city of the United Arab Emirates. This place is best described as “Las Vegas on Steroids without gambling”. This is my third visit to Dubai, but it has been about 8 years. In 1991 Dubai had one skyscraper…it now has over 900. 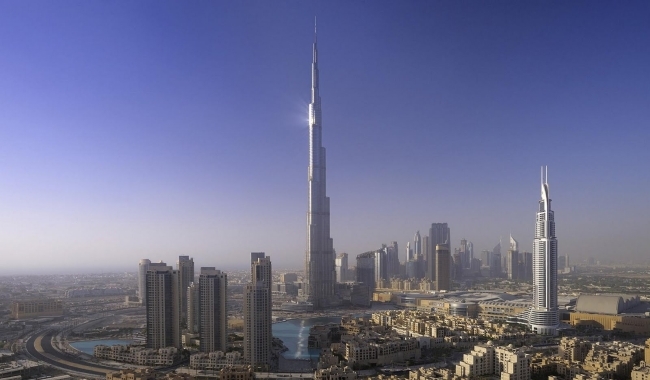 However, Dubai has one building that dwarfs all of the rest; the Burj Khalif, the tallest building in the World. Once known as the Burj Dubai, the building is now known as the Burj Khalif, named after President of the UAE and ruler of Abu Dhabi, Sheikh Khalifa bin Zayed al Nahyan. Abu Dhabi lacks the pizzazz of Dubai, but has one thing Dubai doesn’t have…good old fashioned oil money! When Dubai experienced financial problems a few years ago, Khalif bailed them out with liquid gold; hence his name is on the building. Seriously, folks, when I saw this thing on the skyline I could not believe my eyes. From a few miles away it looks as thin as a needle…and one wonders if the “footprint” of the building is small compared to most skyscrapers. When you get close, you realize that this structure is the real deal…with a footprint much larger than Chicago’s Willis (Sears) tower. However, the windy city did have a part in this largest of all buildings, with all engineering and architectural work for the Burj Khalif done by Skidmore, Owings and Merrill of Chicago. This same firm also did the work for the new World Trade Center in New York. To give you an idea of the relative height of the Khalif, the Willis (formerly Sears) Tower in Chicago has 108 stories and rises 1,450 feet. The Khalif has 163 floors and rises 2,717 feet. The second highest building in the world, the Shanghi Tower, has 121 floors and rises 2,073 feet. The Khalif exceeds its closest rival by 42 floors and 644 feet. That’s not even close. This, my friends is THE WHOPPER OF BUILDINGS! 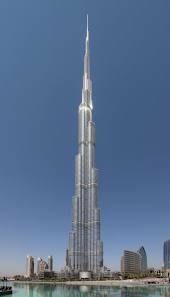 The exterior cladding of Burj Khalifa consists of 1,528,000 sq ft of reflective glazing, and aluminum and textured stainless steel spandrel panels with vertical tubular fins. A 304-room Armani Hotel, the first of four by Armani, occupies 15 of the lower 39 floors. Burj Khalifa can accommodate up to 35,000 people at any one time. A total of 57 elevators and 8 escalators are installed.The building has 2,909 stairs from the ground floor to the 160th floor.